“I have always been interested in and connected with growing things. My aunt, Ophelia Taylor, was a day lily hybridizer, and my mother and father were seriously interested in camellias. My interest in wildflowers began with trips to North Carolina, where I would see the breathtaking swatches of beauty along state highways and wonder how Florida could do the same. I later heard of Dr. Jeff Norcini’s project in Monticello. Jeff was growing small plots of native seed and comparing their progress with that of non-natives. The results were notable. We talked from time to time about his research. 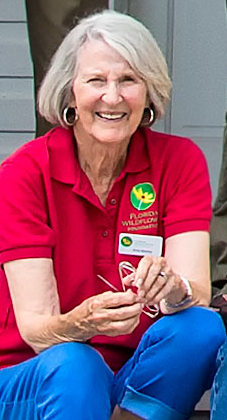 “I also had occasion to meet Gary Henry, who was with the Florida Department of Transportation then and working with the garden clubs of Florida to secure the signatures required for the creation of the State Wildflower tag. During that same time, the early ‘90s, Lady Bird Johnson invited the first ladies in the Southeastern states to meet at Calloway Gardens in Georgia to discuss the planting and distribution of wildflowers along our federal highways. “First Lady Rhea Chiles invited me along and suggested I be the Florida representative. That was followed up with a visit to the Lady Bird Johnson Wildflower Center in Texas with Gary and Jeff. Finally, the license plate was approved with the help of then Lt. Gov. Toni Jennings from Orlando.